This user guide is outdated! Please help improve a new one on camera_help! 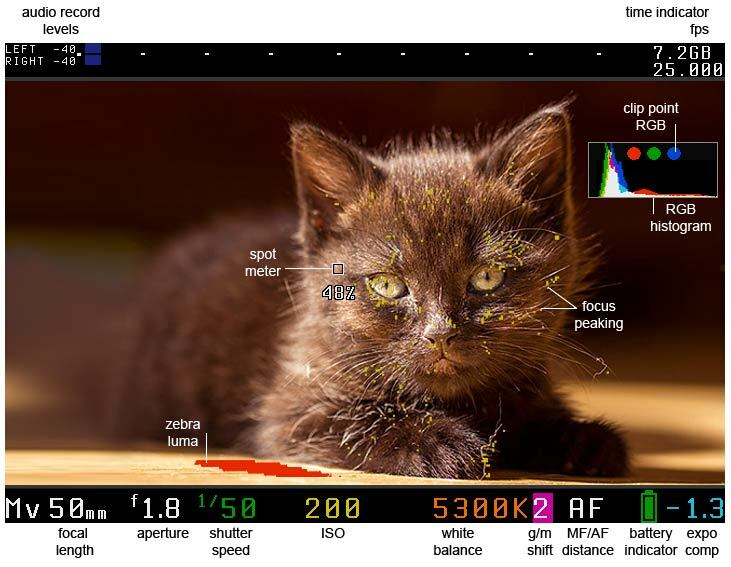 Exposure helpers: ETTR, zebras, false color, histogram, waveform, spotmeter, vectorscope. If you have a bootable SD card and have the BOOTDISK flag set in the camera (which the installer does), and you do not have an AUTOEXEC.BIN file on the card the camera WILL NOT BOOT! It will hang and not wake up until the battery is removed. If you encounter a locked up camera, quickly remove the battery. When in doubt, remove the battery and reboot. And, remember that this software can damage or destroy your camera. First second of recorded audio may be very loud. Sometimes, rack and stack focus simply refuse to work, and you need to restart your camera. SD monitors are not completely supported (magic zoom and RGB tools will not work). Magic Lantern has no audio controls for Canon 600D/T3i and newer cameras. You can disable AGC from Canon menus though. Most cameras have a dedicated movie mode on the mode dial. In this case, it's obvious what movie mode is. For Canon 5D Mark II: in LiveView, with movie recording enabled AND LiveView display set to Movie. Tip: you can change LiveView display type from Expo menu. For Canon 50D: in LiveView, with movie recording enabled from ML menu. When movie mode is active, Magic Lantern will show a Mv symbol on the bottom info bar. 5D Mark II: use the Picture Style button. 50D: use the FUNC button. 500D: use the LiveView button. Magic Lantern uses the available screen space to display operational information in a clear and practical manner. The image shows a screenshot with commonly used ML features enabled. Audio meters: this shows the audio record levels, in dB. The bars become yellow at -12 dB and red at -3 dB. FPS: the current FPS value is displayed with 3 decimal places (25.000, 24.000, 23.976 etc). Shutter speed: in movie mode, values that maintain a certain amount of filmic motion blur (180 degree shutter) are displayed in green. In photo mode, values that may cause blurry pictures are displayed in red. ISO: values with low noise (negative digital gain) are displayed in green. 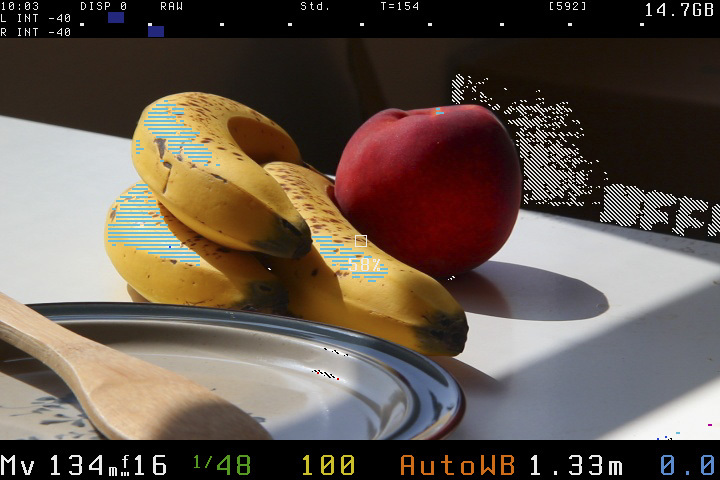 Clipping dots on histogram: they appear when the image contains overexposed areas. Green/magenta white balance shift: not all cameras let you adjust these in movie mode; fine-tune them from White Balance submenu in ML menu. 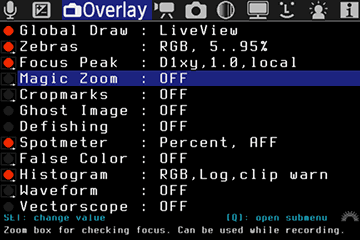 Q (550D), UNLOCK (60D), DISP (600D), LV (500D), FUNC (50D) or Picture Style (5D Mark II): show exposure tools (zebra, false color, histogram, waveform, spotmeter) and cropmarks (as configured from Overlay menu). SET + Main Dial (Scrollwheel) in PLAY mode: customizable function (preview HDR images, silent pictures, multiple exposures, timelapse playback, image comparison). See SET+MainDial. LV: create a transparent overlay from current image (when Ghost Image is active). You can use it for panoramas or for repeating shots. LV on 60D/600D: you can configure it to protect images with a single button press. SET+Erase: you can configure it to erase images without the confirmation dialog. Zoom In: quick image magnification: a single click can zoom all the way in, on center point, on AF point etc (configurable). LCD backlight, saturation and display gain. You can select what functions you need from Arrow/SET shortcuts submenu, under Prefs. 5D Mark II: the Picture Style button. Besides the shortcuts, arrow keys can also be used for focusing (see Follow Focus). See also our Shortcuts article. SET pressed at startup: loads vanilla firmware (does not load Magic Lantern). INFO/DISP in LiveView: change current display preset, if this feature is enabled. SET in LiveView: center AF area (the little rectangle). Activating AF mode dialog when Manual Focus is active will toggle Trap Focus. Press ERASE button to bring up the Magic Lantern menu. Use arrow keys, joystick or scrollwheels to navigate. Use SET and PLAY to toggle values. Use Q to open a submenu with more settings. Press INFO or DISP button to get help. In LiveView, press Zoom In to preview the image behind ML menu. Press MENU to hide items that you don't use (to reduce clutter). 5D Mark II: press the Picture Style button. 50D: press the FUNC button. 500D: press the LiveView button. Close ML menu with a short half-shutter press. This menu is not available on Canon 600D / T3i. The 600D/T3i already has manual audio control, but right now it's not possible to change audio settings from Magic Lantern. You can only use audio meters during recording. Gain applied to both inputs in the analog domain. If you use an external preamp, set this parameter as low as possible; otherwise, set it as high as possible without clipping (audio meters should be green). Digital gain applied to left and right channel. Recommended setting: 0. Auto int/ext: camera detects if a mic is plugged in. Int is dual mono, ext is stereo. Digital high-pass filter. See AK4646 datasheet p.34. 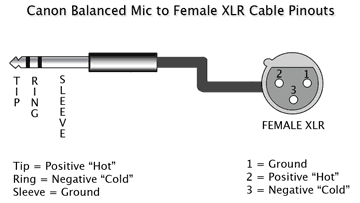 This is required for internal mic and certain types of external mics, but it reduces input impedance. See AK4646 datasheet p.31 and the Mic power control thread. OFF: input impedance is 30 kOhm. This setting is always ON when input source is either internal mic or L:int R:ext. 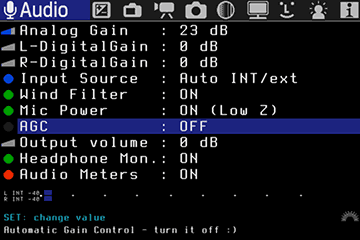 Enable/disable Automatic Gain Control. AGC is applied only in digital domain (i.e. it overrides digital gains, but you can still adjust analog gain). Disable this setting if you are using a SD monitor! This feature is not available on 600D/T3i. or you may solder it yourself (you will have to cut your A/V cable). Warning: mobile phone cables will not work; even if the connector looks similar, it's not identical. You must use the original cable which came with your camera. For details, see Audio monitoring HOWTO on Vimeo group. Digital output gain for audio monitoring. It does not have any effect on the internal camera speaker. For best results, you should a pair of low impedance headphones, for example Audio Technica ATH-M50 (38 ohms). With high-impedance headphones, you may have to use a headphone amplifier like FiiO E5. Display the input audio level, from -40dB to 0dB; meters become yellow at -12 dB and red at -3 dB. Audio meters are only displayed in movie mode. orange = Canon ISO with good noise or dynamic range characteristics (100, 160, 200, 320 … 3200). green = ISO with negative digital gain applied via DIGIC (80, 90, 160, 320 - obtained by setting ML digital ISO to a negative value). These can have lower noise or better highlight rolloff than their Canon counterparts. red = ISO with positive digital gain (avoid these values). ML digital ISO (DIGIC) - in movie mode: negative values will reduce noise, but may cause color issues in highlights. This feature enables ISO 50, ISO 51200 and many other intermediate or astronomical ISOs. In photo mode, Magic Lantern displays shutter values rounded to 2 significant digits (e.g. 1/50 may be displayed by ML as 1/48). This is not a bug. In movie mode, shutter values are displayed with 3 decimal places (for example, in PAL mode, Canon uses 1/33.333 to avoid flicker). To use shutter speeds normally not available in Canon firmware (like 1/25 or 1/8000 in movie mode), enable exposure override. Adjust aperture. When exposure override is enabled, you can adjust it in 1/8-stop increments. You can use a different picture style when recording (toggled automagically). May be useful with flat picture styles. Manual video exposure controls in cameras without it (500D, 50D, 1100D). Side effect: in photo mode, anything slower than 1/25 seconds will be underexposed in LiveView. Automatic Exposure to the Right (ETTR or AETTR) is a technique of setting the exposure of a scene such that few or no pixels are are over exposed (blown out) thus maximizing the information captured without loosing information to over-exposure. This may produce a darker image but this can be corrected later in post processing. The exposure curve is thus as far to the right as possible without it being clipped. For more information on ETTR, see the page Auto Exposure to the Right. You may adjust thresholds for underexposure and overexposure, or you can disable zebras while recording. Note: when using the Technicolor CineStyle picture style, luma will have values between 16 and 255; therefore, you will have to set the underexposure threshold to 16 or greater. Focus assist function. High-contrast lines will be marked by blinking dots showing which part of the image is in focus. D1xy: computes first image derivative on X and Y and takes the max value. May work better in low light or on noisy sensors. D2xy: approximates second image derivative with a 3×3 Laplacian kernel. May be more accurate in good light. Grayscale img: if enabled, LiveView will displayed as grayscale (but still recorded as color). To see how it works, check this article from Luminous Landscape. HalfShutter: triggered when you press the shutter button halfway. Focus Ring: triggered by turning the focus ring. Zoom.REC: triggered by pressing Zoom In button while recording. If your camera has a LCD sensor, you may also cover it and press Zoom In. Other parameters: size, position, magnification. Zebras, focus peaking and false color are disabled automatically when the zoom overlay is active. Focus triggering only works with lenses that report Focus distance, or when you use follow focus / rack focus. In some modes, half-pressing the shutter may temporarily hide the zoom overlay. Original implementation: Magic Circles by AJ. If you use custom cropmarks, place them in ML/CROPMKS folder on your SD card and give them short 8.3 names. You can place at most 9 cropmarks on the card. Get more cropmarks from the ML cropmark repository or draw your own (see Cropmarks). To select the image, go to Play mode and press the LiveView button. Move the ghost image in LiveView with arrow keys; center or hide it with SET or joystick press. This feature works best in photo mode (outside LiveView). Defishing uses a pre-computed look-up table (LUT). It is possible to create LUT files for any other lens or projection by defishing vram/xy.png with your favorite defishing software, and then running vram/defish-lut.m to get the LUT file. All the required files are found in the ML source tree. Project files (*.PTO) for nona (hugin) are provided for both rectilinear and Panini projections. you may configure a display preset with False Color and toggle it with a single button press. you may also use false colors to highlight 50% and 70% brightness levels, or to reveal color banding, or to check for uniform green screen lighting. These exposure tools will show the distribution of image brightness levels. To learn how to read these graphs, see Understanding Histograms and Final Cut Waveform Monitor. This tool shows the color distribution with an U-V plot. Useful for color grading. To learn how to read it, see Introducing Color Scopes: The Vectorscope. CBR: constant bitrate. You specify a factor for multiplying default video bitrate, between 0.1x and 3x. CBR 1x is the firmware default setting. QScale: constant quality, variable bitrate (VBR). Available values: -16 … +16. Lower numbers mean higher bitrates. Firmware default: completely disable bitrate control. Increasing the bitrate may cause recording to stop. You need a fast card. CBR actually works by adjusting QScale on the fly; the instant value is displayed near the recording dot. In QScale mode, bitrate is completely out of control (don't use it!). In CBR mode, QScale will not go outside [-16…+16]. When QScale reaches the extreme values (-16 or +16), bitrate will be different than your CBR setting. Watch the bitrate indicators. This is not a bug, please do not report it. You can push the bitrate higher if you record without sound, then use Audio RemoteShot to sync the video with an external audio track. You can't change this setting during recording. If buffer usage gets too high, ML will pause all CPU-intensive graphics. Change the BuffWarnLevel setting to customize this. If this setting is ON, Magic Lantern will write out a metadata file for the each movie to MVI_1234.LOG (numbered after the movie). The log file contains lens and exposure info, as well as a timestamp every time any of the parameters is changed during recording. Log files are placed in the same folder as the movies: DCIM/100CANON/, 101CANON etc. Tip: you can rename LOG files to CSV and import them in MS Excel. Tip: with this, you can use a wired remote to start/stop recording. 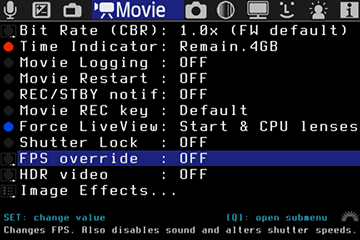 Force LiveView in Movie mode (bypass the dialog saying Press LV button to activate movie shooting). This option locks the shutter value in movie mode (you will be able to change it only from ML menu). This setting alters FPS for all video modes. Only undercranking works well. FPS is changed by altering two timer values (let's call them Timer A and Timer B). Increasing any of these values results in lower FPS. Aside from FPS, changing these timers may alter shutter speed and rolling shutter. Desired FPS: choose a value from 0.2 fps to 65 fps. If the desired value is not possible, ML will choose the closest safe option (look at 'Actual FPS' below). Low light: use this option for recording timelapse with shutter speed set to 1/fps (360 degrees); at high FPS values, you may be able to use other shutter speed values. Exact FPS: try to achieve an exact FPS value, such as 24.000 or 30.000 or 12.500. If more exact solutions are found, ML will choose the one with lowest jello effect. High FPS: changes FPS without altering shutter speed and allows a slight overcranking (60D, 600D). LowJello, 180d: try to minimize the jello effect (caused by rolling shutter), while allowing you to expose at 180 degrees (0.5/fps) if possible. Shutter range: displays the available shutter speed range with current settings. When you use FPS override, Canon menu will still display 1/30 … 1/4000, but the actual shutter speed will be different; read it from ML displays. You can alter shutter speed range by changing the ratio between the two timer values (decreasing timer B will result in faster shutter speeds available). Timer A: displays the value of timer A and lets you fine-tune it. ML will re-adjust timer B to match your FPS choice. Timer B: displays the value of timer B and lets you fine-tune it. ML will not re-adjust timer A, so this option will let you fine-tune the exact FPS value. TG Frequency: displays the crystal oscillator frequency of the FPS circuit driver (read-only, depends on your camera). Actual FPS: this displays the current FPS, computed as TG_FREQ / timerA / timerB (read-only). Sound Record: by default, ML will disable sound recording when FPS override is enabled; otherwise, audio will go out of sync and recording will stop. Only enable sound if you know what you are doing. This function will not change the frame rate from the video header; the video will playback at the setting from Canon menu. Recommended usage: set FPS to a very low value (for example, 3fps) to record a timelapse. Tip: this feature also works in photo mode, making LiveView usable in dark environments. Combine it with display gain. To get 180-degree shutter speed at very low FPS, simply discard half of the frames in post. If 0.2 FPS is not enough, use Frame Merger (a VirtualDub plugin). Exact frame rate may be rounded to be an exact multiple of PAL/NTSC frame rates. NTSC modes: 30p/60p/24p. Rounded frame rates: 29.97fps, 23.976fps, 11.988fps and so on. For fine-tuning and calibrating custom frame rates, use EOSTimerGen. This feature allows you to shoot a high dynamic range video by alternating ISO every other frame. Select the two ISO values from the submenu. Cartoon look (for this to work, set sharpness in your picture style to any nonzero value). Enable movie recording on 50D (1920×1080, 30fps, without sound). To start recording, go to LiveView (P/Tv/Av/M) and press SET. This feature was not thoroughly tested by Canon and may be unstable (even if you record without ML). Always disable movie recording when you don't use it. Battery will drain quickly when recording; also, the camera may overheat. The camera will not record sound. You can use an external recorder (for example, Zoom H1, H2 or H4n) and sync the sound in post with a clapperboard. You can't play back movies in the camera. This setting remains active even if you start the camera with standard firmware (until you clear your settings). Block during REC: blocks the shutter and related (AF, *) buttons while recording. In 50D, taking pictures while recording would result in ERR99; with this option, you can avoid taking pictures while recording by mistake. Side effect: this will disable image stabilization during recording. Hold during REC (IS): ML will keep the shutter button pressed half-way during recording, which will enable image stabilization (IS). Side effect: you need to press the shutter button half way to turn IS off before the camera will let you stop recording. Functions for stills shooting (some of them work for movies, too). 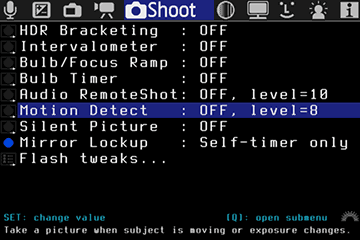 In M mode, this function does shutter and/or ISO bracketing. In the other modes it does exposure compensation bracketing. To start bracketing, take only the first picture and ML will continue the sequence. To preview HDR images in camera, set SET+MainDial: ExposureFusion from Prefs menu, Image review settings, then go to playback mode, hold SET and turn the main dial (wheel). For each HDR picture set, Magic Lantern may also write a bash script for stacking the exposures with enfuse (version 4.x), with optional alignment (align_image_stack). More info: Exposure Fusion: What is it? How does it Compare to HDR? How Do I Do It?. You can stop the intervalometer by rotating the mode dial, by pressing MENU or PLAY, or by turning off the camera. Start delay (up to 8 hours). In movie mode only: duration of a movie clip. To avoid flicker, shoot in manual mode, use manual white balance, avoid short exposure times and use a manual lens (if you use an EF lens, lock the aperture and unscrew it). To make a timelapse without increasing shutter count, do not use the intervalometer; instead, set FPS override to a very low value (for example, 3fps) and start recording. When using the intervalometer in LiveView with noisy mode, your shutter will wear twice as fast than outside LiveView. If the intervalometer can't be stopped (it may happen in crazy mode), turn the camera off or open the card door. Adjust your auto-off setting to longer than your timelapse interval the camera will turn off before the second shot. When not in LiveView, press DISP or INFO to turn the display off. In LiveView, ML will turn the display and the sensor off during idle times if you enable this option from Powersave menu. While the intervalometer is running, the card led will blink once per second to let you know it's alive and kicking. Exposure algorithm is a feedback controller designed with pole placement - the closed loop response will have two real poles placed at the smoothing factor value. Smoothing factor is computed in such a way that, when scene ramping speed matches the speed selected in menu, ramp is followed at exactly 1 EV behind it. If the lighting changes suddenly a few stops between two shots (for example, you change the ND filters or the aperture), the algorithm should recover completely after 2 or 3 shots. A sudden exposure change is considered when the exposure difference is greater than 2 stops. 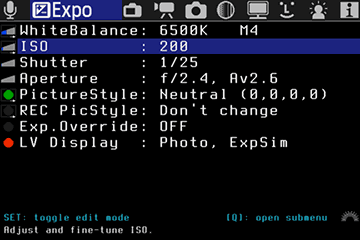 When you use bulb ramping, Magic Lantern will save a log file with the exposure parameters, metered values and so on. Please send this file to developers. These log files can be used to see how well the ramping went and to fine-tune the algorithm. Bulb timer is started by holding the shutter button pressed halfway for one second (full-shutter press will not work). You may cancel the exposure earlier by half-pressing the shutter button. Bulb timer also integrates with other ML features, such as intervalometer or exposure bracketing. This feature is useful for avoiding camera shake. In Movie mode, the Wave 〰 setting is able to start and stop recording movies. The other modes can only start recording (because it's too easy to stop recording by mistake). While recording, the Near and Away modes can trigger the rack focus operation. Start/stop remote audio trigger. To take a picture (or start recording a movie), make some loud noise, for example, clap your hands or pop a balloon. Be careful: this may trigger the shutter from the sounds made by camera (like focus beep or noise from operating the buttons). Exposure change: it only reacts to brightness changes. Detects large moving subjects which cause significant change in exposure. Detection time is somewhere between 200 and 300 ms according to DataGhost's speed test; it's faster with silent pictures. This feature is reserved to very advanced users. It can take pictures in LiveView mode without moving the mirror. When enabled, it saves uncompressed YUV422 frames from the LiveView image buffer when you press the shutter halfway. Silent Picture: simple, low-resolution. Image resolution is usually around 1 or 2 MPix, and depends on the current mode (zoom or not, recording or not, and movie resolution). For almost-FullHD resolution (1720×974), choose FullHD to record a dummy movie. Silent picture setting is applied to intervalometer and remote triggers. It will also go to LiveView when you press the shutter half-way. Therefore, you should only enable this setting when you actually use it. For MF users: takes a picture when the subject comes into focus. Hold AF button: you need to hold the autofocus button (half-shutter, * or AF-ON, depending on your settings). Continuous: you don't need to hold any button; ML will hold the half-shutter pressed for you. This will also block most buttons; press the shutter halfway to unlock them for two seconds. Outside LiveView, it only works with lenses with chip. In LiveView it only works for photos, and it will take a picture when the focus indicator has (almost) maximum value on the focus graph. You may have to turn the lens back and forth a few times in order to let ML compute the correct focus scaling factor for the current scene. If you move from a high-contrast scene to a low-contrast one, you will also have to wait a bit until the high-contrast data disappears from the focus graph. Press SET to temporarily disable automatic scaling of focus magnitude. Change the focus pattern with the arrow keys and SET; you may or may not receive visual feedback. Press the Zoom In button twice to see the current selection. You can use the custom focus patterns in LiveView Quick Focus mode, too, but the pattern won't be displayed on the screen. This feature was ported from 400plus. Arrows: you will be able to focus with the arrow keys. LCD Sensor: on 550D/500D, focus by placing your hand near the LCD sensor (avoiding shake). To use this, you may need to disable LCDsensor Remote. 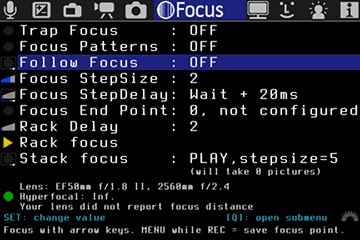 Delay between two successive focus commands, with an optional waiting flag (Step Wait). If Step Wait is not active, ML will only wait a for fixed delay before sending next focus command. This will reduce stutter, but may affect rack focus accuracy. This setting is recommended if you only use follow focus. If Step Wait is active, ML will wait until each focus command is completed, and then it will wait for a fixed delay, as configured here. This will increase rack focus accuracy, but may cause stutter with certain lenses. Sets the number of seconds before starting a rack focus. This lets you film the start point first, then initialise the rack focus without touching the camera. First you have to set the end point. Focus the lens, then press SET on this menu item. After pressing SET, ML will display Focus End Point: 0 steps from here.. This means the end point is now assigned to current focus position. At this point, you will see the LiveView image and set the start point using left and right keys (just like with follow focus) or the main dial (scrollwheel). The start point will be always the current focus point (which you are changing); the end point will remain fixed. Triggers the rack focus operation that moves between the start and end focus points. After the move is complete pressing again reverses the move. Pick the end point of rack focus by focusing on it (manually or with AF). Configure focus parameters (step size and delay). Different lenses may require different parameters. Open the Focus menu, go to Focus End Point and press Set to zero it out. Pick the start point by focusing on it with the LEFT/RIGHT buttons while the Focus menu is active. Make sure the number from Focus End Point is changing as you focus. Fine-tune the position with scrollwheel. Go to Rack Focus and press SET or PLAY to start rack focus. To return to the starting point, run rack focus again. while recording, you can start rack focus from outside the menu, by pressing PLAY. when LCDsensor Remote is set on Near or Away, you can trigger rack focus from the LCD sensor, avoiding camera shake. optional: check your settings with either Silent Pictures or Snap Simulation (Shoot menu). This lets you run the focus stack without wasting shutter actuations, and fine-tune the settings as needed, before running the final sequence. disable Silent Pictures / Snap Simulation and run the final focus stack sequence, with full-resolution pictures. Start the focus sequence (“Run focus stack”). The distance to the focal point. Value is returned by most newer Canon lenses. If the lens does not report any distance information, 0 will be displayed and the DOF calculations will not be correct. Options for display (most of them are for LiveView). Values: Normal (no effect), High, Very high, Zero, Very low, Low. Values: Normal (no effect), High, Very high, Zero (grayscale). Photo mode only: this feature increases the brightness in LiveView, making it usable in very dark scenes (where Canon's LiveView would be pitch black). Combine this with FPS override for better low-light performance. For movie mode, use ML digital ISOs for a similar effect. This affects the colors and brightness of the on-screen information (including LiveView overlays, Canon menus and ML menus). Range from: Bright (default), Dark, Bright Gray, Dark Gray, Dark Red. Tip: dark themes may reduce the eye strain during night shooting. HalfShutter: Hold the shutter half-pressed, or the * button, or DOF preview for around 1 second to clear all the overlays from the Live View display (audio, zebra, crops, shutter speeds…).Tip: assign autofocus to * button (from Custom Functions, set Shutter/AE lock button = AE lock/AF). WhenIdle: In this mode, all the overlays are erased from the screen (100% clean display) when the camera is idle (i.e. you don't press any buttons). Always: In this mode, all the overlays are erased from the screen; you will have to change shooting settings blindly. You can still use the menus.Tip: this feature may be useful with External Recorders, since it removes the focus box and other graphics from the display. This option will force a low-resolution mode on HDMI displays (720×480), which avoids black screen when you start/stop recording. 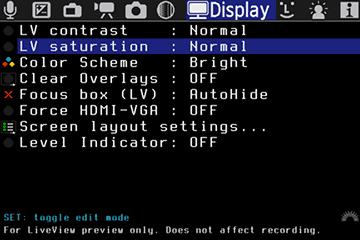 Choose screen layout (position of ML top and bottom bars), for different cameras or for external monitors. This may make the image better visible from different angles (especially on cameras without flip-out screen). This mode is useful if you want to mount your camera upside-down. For cameras with flip-out LCD, this options prevents mirroring the display when you open it at 180 degrees. For cameras with flip-out LCD, you may select a different flipping/mirroring option. Shortcut for erasing images without confirmation (hold SET and press ERASE). Be careful! This will make the DOF preview button sticky (so you no longer have to hold it pressed). Note: enabling DOF preview will block certain buttons. Tip: enable Exposure Override to preview DOF without blocking the buttons. This will make the half-shutter press sticky (so you no longer have to hold it pressed). Tip: use this to prevent the camera from turning off LiveView after 30 minutes. Enable power saving: on Standby, during Recording, or always. Dim display: In LiveView, if the camera is idle, Magic Lantern will reduce the LCD backlight level to minimum in order to save power. Turn off LCD and LV: this will turn off the display and the sensor activity in LiveView. Mirror will not be moved. If the camera is recording or motion detection is enabled, only the display will be turned off (so recording will not stop). Turn off GlobalDraw: if the camera is idle, ML overlay graphics will be disabled to reduce CPU usage. Config Autosave: If enabled, settings are saved automatically to magic.cfg whenever you change a setting in ML menu. Config saving process will take place as soon as you close the menu. Save config now: Save ML settings to ML/SETTINGS/MAGIC.CFG. Delete config file: use this to restore ML default settings. After deleting the config file, restart the camera. On the top bar, you will see DISP 0, 1, 2 or 3. Each of those is a preset for the settings in Overlay menu. So you can, for example, configure DISP 1 with false colors, DISP 2 with zebras and focus peaking, and DISP 3 with clear display. This menu item sets the maximum number of available DISP presets. To disable this feature, set the number of presets to 1. 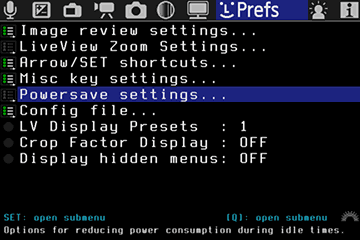 To change the current display preset, press INFO/DISP in LiveView, or [Q] on the GlobalDraw entry in the Overlay menu. Print screen after 10 seconds. This option saves a BMP file for the overlays and a 422 file (silent picture) for the LiveView image. The BMP does not contain transparency data. You can combine the two files in GIMP or other image editing programs. The card LED will blink every second, until the screenshot is taken. This option runs various tests to make sure Magic Lantern is stable and will not crash. You can use it to test your particular configuration. If it crashes, report an issue.